Emma Munro-Wilson has had a love of music since childhood, growing up in a musical family. Her early musical training began at Heathfield School, Ascot. Subsequently Emma went on to train at The Italia Conti in the City of London and thereafter won a place to study Musical Theatre at The Arts Educational School. Emma’s first loves are Jazz and Swing. The freedom of expression within the music and the joy of the lyrics are key to her performance. Her inspiration includes an eclectic mix of performers: Hoagy Carmichael, Billie Holiday, Cole Porter, Nat King Cole, Sarah Vaughn and Ella Fitzgerald. Each performer has left their unique mark on her individual style. The breadth and depth of Emma’s career has led her to exotic international locations, including the opportunity to headline for ‘The Rock Legends’ Tour of South Africa performing with a 55 Piece Orchestra, conducted by Ian Sutherland. She has also had extensive experience working within the corporate entertainment sphere, recent career highlights include her role as the principle singer on Cunard’s Queen Mary II and a finalist in the BBC Radio 2 Voice of Musical Theatre competition. Emma Munro Wilson formed her own Jazz Quartet in 2007. 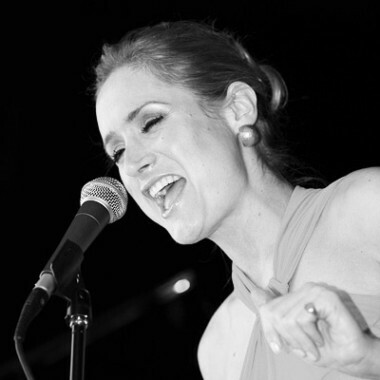 She strives to provide a unique and tailored musical experience for each of her clients and is available as a quartet, trio or piano and vocal, for Corporate Events, Private Parties and Weddings.